Boot shopping a bit difficult? Looking for a few great places to shop for wide calf boots? Check out these 9 places to shop for them! Life as a plus size woman with wide calves can be tricky, especially when it comes to shopping for Wide Calf Boots. All that you know is that you have wide calves and boots tend not to fit. Well, no worries! Hopefully this little guide will help you out! What I have done is round up a few places that you can shop for your fabulously full calves that still give you FASHION along with my wishlist of 9 faves. This sample sale and discount retailer offers sooo many options seasonally and at great deals too! I just wrote about this Boot Brand- especially for over the knee options. DUO Boots delivers wide calf boots up to a 50 cm (roughly 19.6 inches) and shoes sizes up to a 12/ UK 43! The site is stuffed with trends, tips, and fashions with free shipping over $250! Available in size 6-12, Evans offers a classic silhouette and arrangement of wide calf boots up to around 19 inches with some bigger and smaller than that. Their newly launched range is definitely worth checking out. Newly launched wide calf selection offers all boots at either $59 or $39 (if you are a member!) starting at a size 16″ shaft, there are quite a few fashionable options that will NOT hurt the wallet! You must check them out. I don’t know the last time you checked out Lane Bryant and their shoe selection but they have boots up to a 19 inch shaft and size 11 or 12s and a few pair of cute over the knee options as well as some ankle booties worth checking out. One of my favorites Nordstrom now includes wide calf and wide width shoe offerings and with a decent range too! Most of my faves are from here! Up to a sizes 13 in various brands and various fits, fashion forward options are available to whet your appetite. Purple boots, a variety of widths and calf sizes, you will find fashionable options for you! Up to a calf width of 24 inches in various shoe sizes and widths, options is KEY here! Patent Thigh High Boots? Whoa, you will find them here. Up to sizes 13 and up to a size 22 inch calf, you will find edgy options, bold cuts, and playful options here for you! I went over to the site and was surprised of the options, especially since WideWidths go up to a size 13ww and offer boots up to a calf size of 20”and higher in selected sizes! Classic and fashion forward options here! Know that the standard for most boots is about a 15” so if you are looking for boots, use this as your guide! Measure your calf at its widest point- And measure both calves too! If the difference is more than half an inch, go up an inch! If you want to be able to wear your jeans tucked in, take this into account when shopping! Measure from your heel to height desired to determine how high you want them to go! Quality is key. The worst thing to do is hunt down a pair of boots only for them to fall apart after one season! I suggest that you invest in them, since you will more than likely be rocking them all season long and beyond! I have boots from five years ago! I love them and live for them! Are you petite, plus size, and have wide calves? WideWidths.com breaks this down quite nicely! Okay, so I hope this helps you out! A great place to start while shopping and options to whet your fashion appetite?!? What do you think? Did this help? Did I miss a favorite shopping place of yours? It’s not necessary for you to ask if your posts help, because you’re always a LIFESAVER. I didn’t know Just Fab launched wide widths! Thank you for the tip dear – I might finally join now! XOXOXO You should there are tons of cute options on there! I joined and ordered Raine in cognac – I’ll be sure to write up a review when I get them. I’m excited! I went to that site… the widest boot I could find on the site was a 16.5″ finally stopped looking. I fell in love with a tall black pair and the price. However when it came I was devastated to find that I could not even get the zipper up past my ankle. I had to send them back. Great post. FYI – Duo does offer free shipping to the US, no minimum. And shipping with them is super fast. But be prepared to get hit with a customs invoice bill from DHL a few days after your boots arrive, for 10% of the value of your boots. I had to return the boots I ordered from them, they didn’t fit right in the ankles, but the boots were great quality. I LOVE THEM!!!!! 🙂 Thank you for that TIP! These are all nice! My legs are so tiny for the rest of my body!! Love this post and all those brown leather ones at the bottom are my favorites! Have you copped a pair yet? I have several pair from Lane Bryant. The over the knee ones are fabulous and I get so many compliments on them. They also have a couple of pair of cowboy boots with a zipper up the back which comes in handy for tucking in your pant legs! I am very happy with the boots from Lane Bryant! They aer good ones! Great finds there too! I totally love riding boots but can’t ever seem to find ones that accommodate my calves. I think one of the shops you mention might just make my fall that much better. THANKS! Turned out to be perfectly what I was looking for, I like quality leather and don’t mind it being higher end because I was so frustrated in not finding good quality wide calf boots for my 18 inch calves. Love it! Ooohhh that you for sharing, I will have to check them out!!!! Omg! Thank you for this! I have never owned a pair of boots (aside from ankle boots) because I can’t find any that fit! Wide widths explains it perfectly for petite women like me (I’m 4’11”) who have a larger calf size (mine measure 16″). Apparently the largest portion of the calf is different for petite women – slightly lower than someone taller. Totally life changing information! thank you so much – I look forward to owning one or two nice pairs of boots in the near future! This is fantastic. I have felt left out of this trend forever, and I’ve been looking for wide calf boots all over. A lot of times stores label boots wide-calf, when they mean just slightly wider, and that’s not enough. : ) Thanks so much for compiling this list! I need a size 8 knee high boot with a 21/2 inch circumference. Can you help me?. 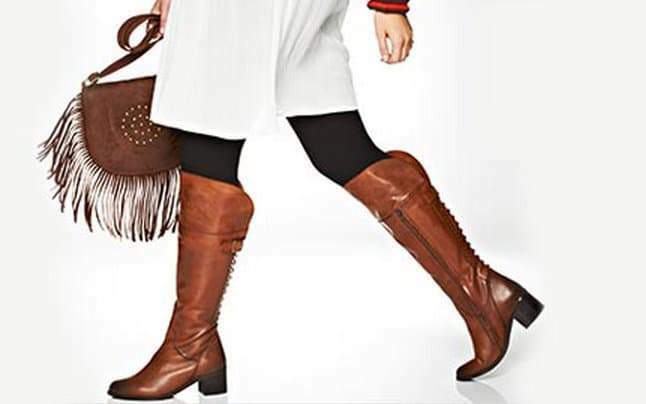 Simply Be has fabulous boots for average to super curvy calves. They also have a wonderful selection of fashionable clothing for women sizes 10 and up. Great site! Did you see the other post with 25 places to shop wide calf boots? You can find what you are looking for in so many places, also, do you know your calf size? Most wide calf boots do account for fuller ankles as well! I am happy to have found this post, and was excitedly hopeful when checking out the Simply Be page. Using their measurement guide, I am a size 9EE with a 22″ calf circumference. What a bummer I was not able to find anything on their page. I’ve checked out the others as well, and very few have calves that go over 19″, especially for a size 9 foot. WideWidths.com seemed to have some, but the prices are exhorbitant for my budget availability. Some brands might as well be asking for the customer’s first-born… trust me, you really don’t want mine. I know, I raised him. I am a plus sized, very curvy, lady with lipedema and lymphedema. From the waist down, my body is at least 2 sizes larger than waist-up, and with the lipo-lymphedema combination, starting at my ankles and going all the way to my waist, my legs, hips, and rear-end just balloon out. I am also beginning some job-hunting. Thus, I am looking for outfits for those important interviews. I found a sweater dress I like, and was hoping to rock it with some leggings and boots. The problem is finding the boots. Ohhhhhhhhhh! Let me see what i can find! Hi, I was wondering about wide calf boots in the true since. My calf is 24inches and none of these go over 21 inches. DO you have something a little bigger? I know I’m several years late but THANK YOU SO MUCH for this article!! I want over-the-knee boots so badly since they’re the hot thing this season and haven’t been able to find anything that will fit me if I want to wear them over pants… Going to Torrid to try out their boots this week! I don’t know if anyone mentioned this store but Avenue! They have saved my life the last few years their boots never disappoint and they have so many to choose from! Hope this helps! Looking companies that that indicate ankle circumference for boot or ankle boots and looking for wide and extra wide ankle circumference. It would save them and me time and money to find what I need. I am Positive many women find themselves in this predicament we do not all have fine ankles and when weight is added and swelling it’s a big problem. And not just in fancy boots, we need everyday boots and working boots Us fine Ladies are not all in leisures-lol. I learned about Duo (Ted & Muffy) boots through this post. I now own two gorgeous pairs of tall boots that fit my calves perfectly. Thank you so much. Thank you! I just ordered a pair of exactly what I was looking for… Thank you so much! I will start here the next time I want something as special as you clearly are. Thank you, again! Where are the boots from in the photo above?! Tall, brown, laced heel?! These are so nice! A couple others to add to the list is Cambridge Select & Woman Within! How about ankle boots /shooties for those of us with cankles and wide width? Any thoughts? Thanks! Ohhhh I will make sure we do a piece on this for boot season!